Charity bingo came about when Pastor Charles H. Hagus approached Lowe for help in raising funds to refurbish his church. Their charity bingo game was a huge success and this method of fundraising became a hit from then on. The fun and sociable game of bingo dates back to 1530 when it was derived from the Italian lottery game, “Lo Giuoco del Lotto”. It wasn’t until the early 20th century that American Edwin S. Lowe adapted and transformed the game into the bingo that we know and love today. Lotto and bingo have always had somewhat of a conscience. Most national lotteries give a huge chunk of their winnings back to society in the form of charity or investment in local social causes. Bingo too, has a raffle-like quality about it, making it an ideal game for charity initiatives and events. 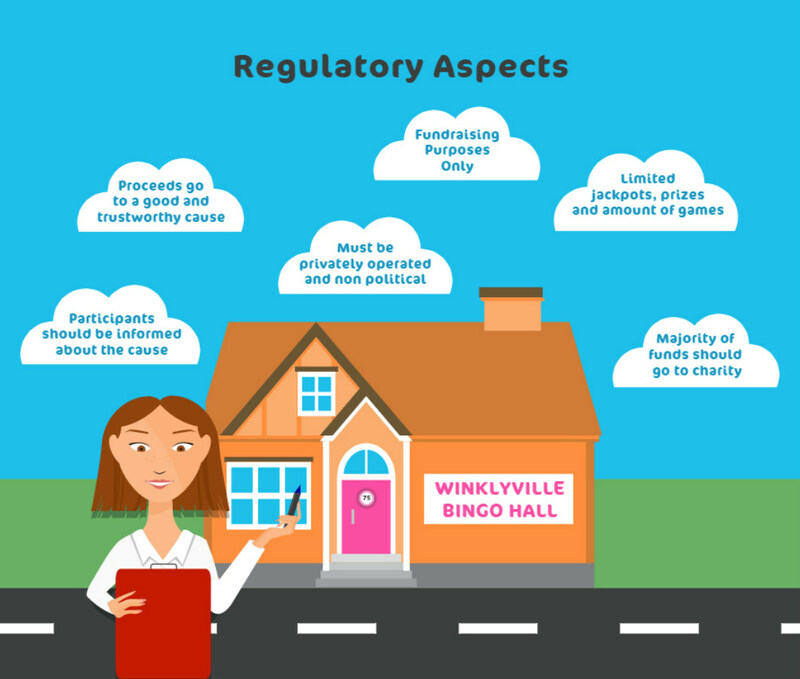 Due to its fun and sociable nature, bingo has an added advantage over raffles and lotteries, making it even more suitable for charity fetes and events. Even though there are occasional cash prizes, most UK bingo halls serve as some form of charity and participants play just for fun, receiving a token prize such as a kettle or a toaster. In the US, bingo events are mostly hosted by churches and charity organizations. With the growing popularity of online bingo, it was only a matter of time before websites started to offer charity bingo as well. These days, online charity bingo is becoming increasingly popular along with the raised sense of social awareness. Bingo originates from lotto, the Italian word for lottery. Bingo and lotto games are often used to raise money for charity. Charity bingo games usually take place in church halls, regular bingo halls and at charity fetes. Charity bingo events are fun and encourage charitable giving. Many online bingo sites now offer charity bingo to support the spike in social awareness. A charity bingo event should be non-profitable and for fundraising purposes only. Charity bingo initiatives are not supposed to retain any private profits. Charity bingo participants should be informed of the cause they are supporting. Charity bingo initiatives must be privately operated without political interference. Depending on the local laws, charity bingo games have a limit to their jackpots, prize value, prize money distribution and amount of games. In charity bingo the incentives are high… Players are able to enjoy themselves, contribute to worthy causes and maybe even receive something in return! Charity bingo is gambling with a conscience. By taking part in a worthy cause, players remove the focus from themselves and give back to others. Whether you win or lose, the outcome is good. 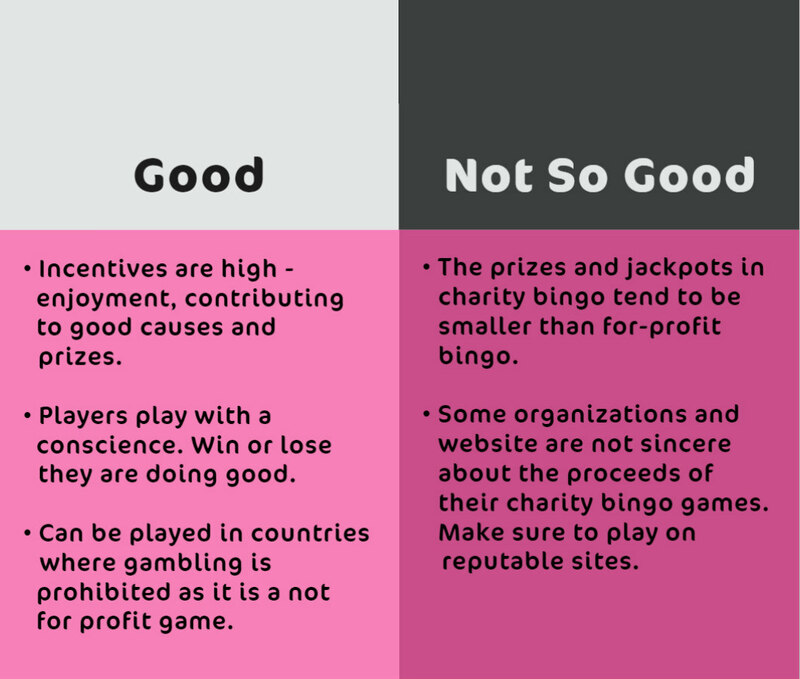 Charity bingo can be played in countries where gambling is prohibited as it is classed as a not for profit game. The prizes and jackpots in charity bingo tend to be smaller than for-profit bingo. Some organizations and website are not sincere about the proceeds of their charity bingo games, therefore people can be duped and misled. It is always best to play with reputable charitable institutions and online gaming sites owned by larger gaming providers. Online charity bingo has become hugely popular. Players love the fact that they can now enjoy their favourite online game as well as contribute to a worthy cause. There are many different kinds of charity bingo sites to choose from. Some give out larger prizes whereas others focus on giving most of their proceeds to the needy. There are websites that only donate a percentage of their profits to charity, whereas others might donate a percentage of deposits. Sites which are owned by registered charities are obliged to donate all of their proceeds. 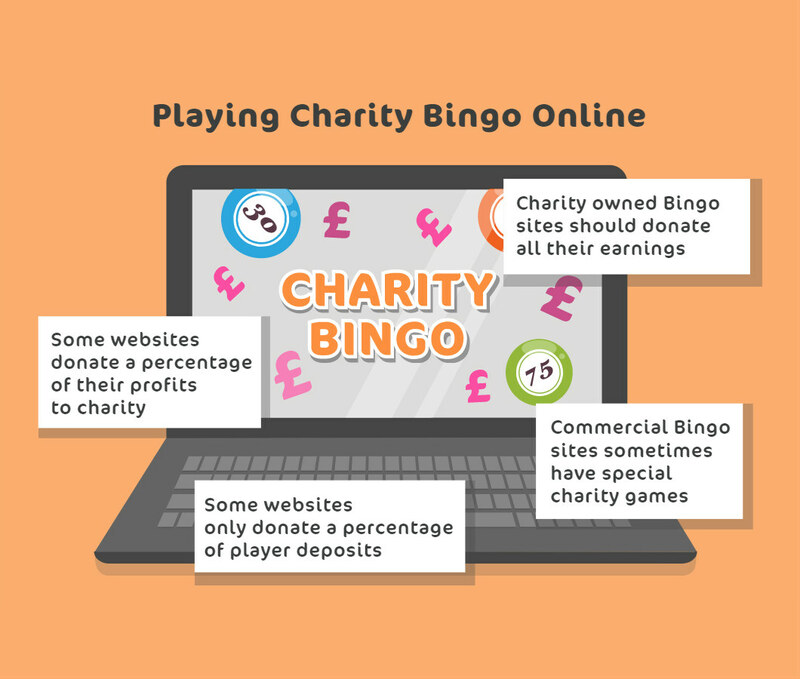 Some profitable online bingo sites have the occasional charity offer, where there’s a one off game to raise money for something in particular. Alternatively, they may have a monthly charity draw of some sort. A perfect example of this is the pairing of top bingo site Wink Bingo and the Peter Andre Fund. Popular celebrity, Peter Andre, set up his cancer research fund following the sad loss of his brother to kidney cancer in 2012. Wink Bingo got together with Andre and created a campaign to raise £50,000 for his charity. The Hearts of Gold bingo special donates 100% of its profits to this worthy cause. The six month promotion hit its target way ahead of schedule and continues to raise funds to this day, proving that bingo and charity can go hand in hand. Some websites donate a percentage of their profits to charity. Other websites only donate a percentage of player deposits. Charity owned bingo sites are supposed to donate all of their earnings. Commercial online bingo sites sometimes have special charity games that are seasonal or monthly. It is comforting to know that there has been a shift towards charitable giving in online gaming. There are more and more charity bingo sites to choose from, supporting a whole selection of causes. Even if you like playing for massive jackpots and large winnings, it can be nice once and a while to play for a worthy cause that is close to your heart, and who knows, you might even win something too!